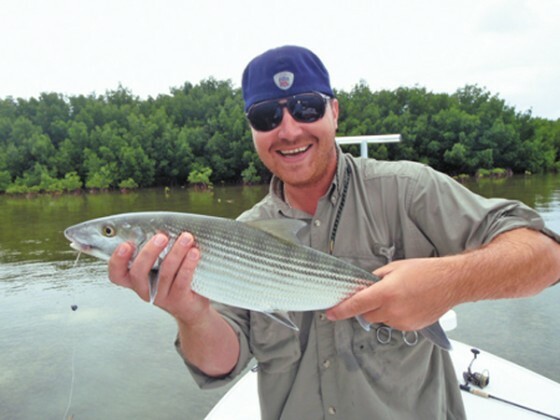 If you have a bonefish or permit on your bucket list now is the best time of year to try to fulfill that dream. Warm water on the flats will dictate that you start your day with the quest for bonefish. As the water warms during the day the bones will seek the more stable temperatures offered by the deeper flats or will completely vacate the flats for the sanctuary of nearby channels. Permit on the other hand are much more temperature stable and will continue to feed well into the hottest part of the day. For permit the more important factor is the level of the tide and the movement of the water over the flats. By factoring the heat of the day and the tides you can come up with a plan of action for pursuing your quarry. Another great plus in fishing the flats this time of year is the lack of competition on the water in the post summer season. The great number of migrant guides patrolling the flats for tarpon have gone back to their streams in search of the elusive trout and left only the truly local guides to ply the waters. This is very fortunate for the search for permit as too much traffic on the flats can put them off their bite and generally put them into a skittish mood. The competition for crabs this time of year is also much less and the local bait shops usually have no problem keeping stocked up on the silver dollar size crabs that are perfect permit snacks. The down side is that the bait shrimp are pretty darn small as a rule and you are better off picking up a dozen select size baits if there are any available leaving the standard size shrimp for chumming purposes if the bonefish are being picky. With larger shrimp you are able to cast them with less or even no additional weight of a split shot or jig head. On many Lower Keys flats the travel paths of the permit and bonefish overlap so it pays to keep both baits ready to present at the same time. On my trips, unless the client has otherwise stated that they are not interested, I also keep a pinfish on a steel leader ready to throw at sharks or barracuda to help fill in the quiet times between the screaming drags that can happen with any flats trip. With fly anglers I tend to keep it to one rod at a time. I usually select a small crab pattern that will appeal to either bones or permit. Rods in the nine or ten weight class might be a little much for bone fish when it comes down to it however I have never had an angler who didn’t appreciate the battle of a bonefish on any given tackle. In a perfect world an eight for bones and a ten for permit however a good compromise is an outfit that will throw a nine weight line. Between tropical systems the wind can go completely still for long periods this time of year. Slick calm water makes for some frustrating days especially when pursuing permit. The frustration comes in when you can see your intended quarry from so far away and in return they see you back. The fish often do not even spook in the normal sense but just keep moving and feeding just out of range for a proper presentation. In this case a little wind can go a long way to keeping the fish calm. Take advantage of this slow time in the fishing season to ply the back waters for those world class trophies that the Keys have to offer.